According to the ancient Hindu principles of city design, streets must be broad and straight, crossing each other at right angles. Such is the design of the unique city of Jaipur in eastern Rajasthan, which fittingly serves as the large Indian state's capital. 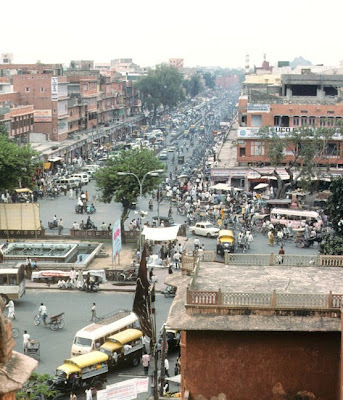 Following an alliance with neighbouring Rajput rulers, and their victory over Mughal invaders, Jaipur's founder and greatest ruler Sawai Jai Singh II began the construction of the city in 1727. Known as the "Pink City" Jaipur is constructed using red sandstone, while buildings from other stones have been colored gerua (Rajasthani for pinkish-orange) to stress the imperial ambitions of Maharaja Sawai Jai Singh II (1699 - 1743). There is a popular misconception that the color was added on to welcome Prince Albert in 1863, but on that occasion the city was generally spruced up, the color was always original from the material used. The old city of Jaipur was protected by a 25 foot high wall, while the surrounding hills were also fortified. Sawai Jai Singh issued invitations to merchants, traders, artisans to come and settle in his city. Their homes were built on top of the shops, which lined the streets, and they were afforded loans for the construction of these havelis. Designed by the Bengali architect Vidhyadhar Bhattacharya, based on the ancient Hindu architectural treatise the silpa-sutra. Water for the construction was brought by a canal from the Jothwara River, and all through the main roads ran aqueducts, to keep the streets cool (now closed up). 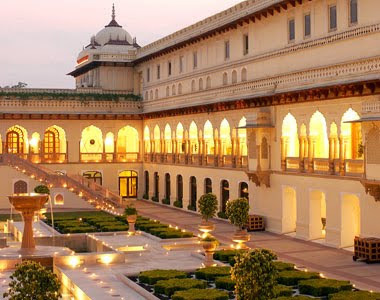 Rajput heritage is reflected in the floral designs, richly carved friezes, the colonnades, kiosks, and niches. The towering Hawa Mahal (wind palace), constructed in 1799 by Sawai Pratap Singh, has 953 intricately carved lattice windows which convert hot winds into cool breezes and afforded a viewpoint for royal ladies and concubines, while protecting their privacy.